We sold our Mitsubishi Mirage 1988 with 220 USD profit. It was an old car, but it didn’t withhold us from pushing the sell and earning some extra cash! It could have been even 500 dollars but we made a couple mistakes as well. In this blog we will share our tips and lessons learned. So you don’t have to make them and are able to sell your car with a profit. This is your sell car NZ guide. 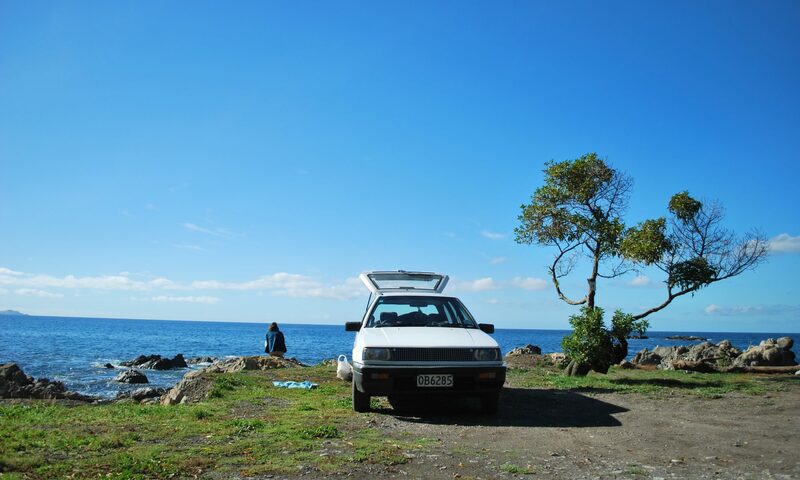 We especially wrote this blog for people who want to sell their car in New Zealand. But when you are a traveler in Australia, and you want to sell your car in Australia (with a profit), this blog will come in very handy as well! The platform Trademe is active in Australia as well and the whole process of buying, bargaining and selling is applicable to your situation in Australia. You probably bought yourself a car on Trademe.co.nz, just like almost everyone does. You were looking for a beautiful adventure and drove around the two islands for a couple of weeks or months. Perhaps you wanted to challenge yourself. You experienced wonderful nature, you hiked a lot and you tasted the famous Ferg burger. You met new people and you made new friends. This has to last forever. But as with all good things in life this journey will come to an end. Probably you run out of time and you want to know: ‘How do I sell my car with profit in New Zealand? !’ Well when this is the case. This is your blog to read. It is quite easy to sell your car in NZ. Trademe is a perfect platform to buy and sell a car and there are a lot of travelers who need a car. 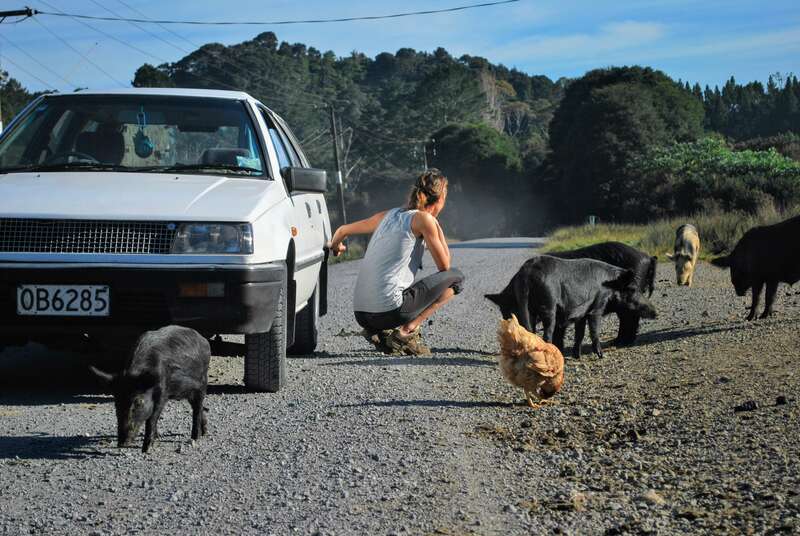 You can sell your car to a Kiwi, a fellow traveler or to an occasion dealer. If you do business with second hand dealers it will be very difficult to earn a profit or to even reach break even. They are clever business men. They know you will leave the country soon so they know you don’t have any leverage. For them it is not a problem when the deal breaks, because they are not dependent on the deal. You are! Which means your bargain position is not too good. Unless you are not aiming for selling your car with profit obviously and just want comfort. They simply beat you and that is not a shame. 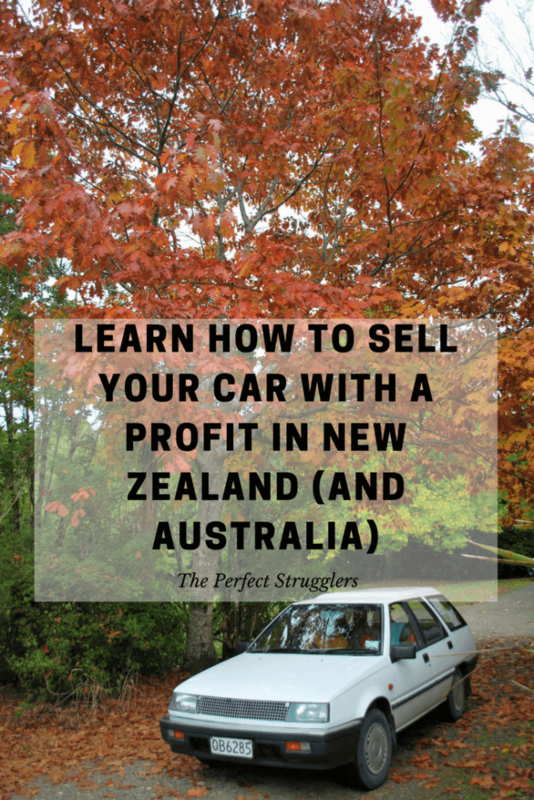 We will present you a couple of tricks how you can sell a car with profit in NZ. This is of course not guaranteed. We managed to make 30% profit with selling our car so why won’t you be able to do the same? The first step to sell a car with profit in New Zealand is to make a good deal in the first place. If you are able to buy a good value for money car it will help you a lot when you want to sell the same car for a reasonable profit. We won’t go into depth here how to make a good deal when buying. But in short. Make sure you have some technical knowledge. Do some market research: what are asking prices for similar cars with similar specs? And the most important one: bargain! If you want to sell a car with profit you have to be smart. Our advice is to show people at a very early stage that your car is for sale. The day you buy your vehicle is the day you create a sign that shows your car is for sale. The reason is very simple. The earlier you find people interested in your car the better chances you have to find your perfect profitable sale. Your car is only considered ‘sold’ when you have the cash you want in your pocket or hands. Before that happens everything is possible. People will change or cancel their offer last minute. Some people will buy another car. Other people stop replying during the process and a thousand of other things can happen and destroy your deal. Always make sure you have at least one other buyer. You will feel more comfortable negotiating with the first one and you have leverage to use if the buyer wants to hassle on the spot. Which gives you a good position to sell your car with a profit. When you don’t sell to buyer A, you will sell to buyer B. Consider this. You bought your car for let’s say 1750 dollars. You double this price and add a little on top of it and you put your car online for sale for let’s say 4000 dollars. Probably nobody will buy your car. Why? If your car would have been worth much more you wouldn’t have been able to buy your car for 1750 dollars in the first place. Of course there are exceptions but don’t count on it. There is no logic in this matter. Selling and buying are pure emotional processes. Be smart and add max 35% on top of your cost price. This will give you room to bargain, to give a discount away and still to make a profit. Why is this so important? Since selling and buying is an emotional process people feel good if they get a discount. Especially when people bargain they will be happy when they manage to get a discount. So be a step ahead and give them a calculated discount after a little bit of bargaining. The buyer will feel good about his skills and effort. He will be excited and probably stop to bargain because you did him already a favor. General rule; give people a little bit and you keep the biggest part. This will definitely help you to sell your car with profit. Be prepared to bargain during the hand over of the car. Although you might already have made a deal. Some people go far to get that extra discount. The thing you can influence is to build in extra bargain room to prevent disappointment. The most important condition to sell a car with profit is having enough time available at the moment you want to sell the car. So make sure you always have time to sell. The shorter the amount of time you have the worse is your bargain position. When the buyer knows you are restricted on time, he will squeeze your dollars out of your pocket. In case you don’t have plenty of time (your flight departs tomorrow), there is no reason to inform your potential buyer about this fact. We made this mistake and it costed us an extra 200 dollar profit. We had to hassle for a new deal. We didn’t have another option than dropping the price because our flight was about to leave in 10 hours. And we didn’t have a plan B (tip #4). So don’t make these mistakes. We already did it for you. The best way to sell your car with profit is to sell to locals or travellers. Backpackers are a good target group to sell your car with profit to. Some people prep. People who prep will scroll meticulously through Trademe. In search for that special car who will provide them with everything they need. If you do your homework well enough they will find you on Trademe. The worst thing you can do is to have splendid pictures on Trademe and cover up little flaws or little broken parts. There is nothing you can fix after you broke trust. So if a potential buyer sees your car and the person discovers all sort of cover ups you will lose your chance to sell your car with profit. Would you trust someone who covers up things if you want to buy something? If you don’t want to fix broken parts because of the costs, mention it in your advertisement. You will be noticed as trustworthy which is better than to be considered a fraud! 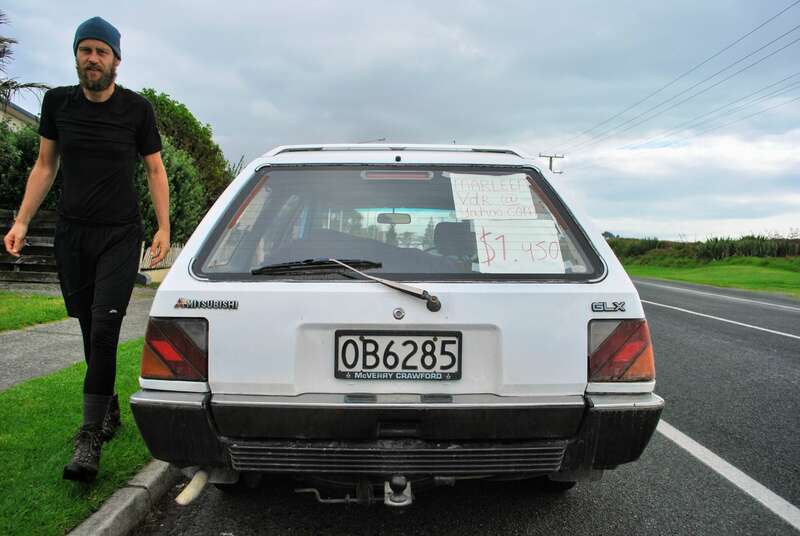 You are not the only one who sells a car on Trademe. This means there are a lot of cars in the galleries. And potential buyers see a lot of cars scrolling through them. You love your car because your car brought you everywhere but a buyer doesn’t know that and doesn’t care. The only thing he or she wants is good value for money. So you have to make sure your car is worth the asking price. This means you have to dive into your car’s strengths and make sure this strength is the first thing the potential buyer sees. For example, when your car has an awesome grill. Capture the front of your vehicle in a picture with a gorgeous view in the back. Make your car a model and don’t give up until you are happy with the result. If you make outstanding pictures you are one step closer to sell your car with profit. Every car needs a Warranty of Fitness (WOF). Without a WOF you are prohibited to be on the road. It simply means your car has been checked by a specialist and he claims your car is save enough to be on the road. Make sure you get a new WOF fixed before you sell or make sure you sell a car within the period the WOF expires. To have an up to date WOF definitely helps you to sell your car with profit. This sounds logical doesn’t it? You would be surprised how many people dump their car on Trademe when the autumn or winter starts. If you want to have an advantage and sell a car with profit try to sell your car in the spring or summer. Especially when you like to sell your car to a traveler, with some profit. At least, be aware the season of selling has a huge impact on the final price. We hope you learned a few tricks by reading this blog. We wish you all the best with your strategy to sell your car. Let us know how your selling adventure ended. If you have questions or you want to add an extremely useful tip how to sell a car with profit; please let us know! Do you want to know how we managed to live in New Zealand for only 777 USD per month including flights? Make sure you read our blog. Like it?! – Pin it!